Managing Endangered Salmon Affect Idaho? Moving NOAA to Interior is an idea Idaho Congresswoman Helen Chenoweth supported two decades ago. Today, it divides environmentalists. A year ago, President Barack Obama used Northwest salmon management as the opening joke for his State of the Union address. "The Interior Department is in charge of salmon while they're in freshwater, but the Commerce Department handles them when they're in saltwater," Obama said. "I hear it gets even more complicated once they're smoked." Now Obama is proposing to rearrange the structure of key environmental agencies. He says the change would improve species management and save taxpayers money. But skeptics worry that it could undercut the scientific independence and integrity of federal biologists. As a part of his government reform plan, Obama is proposing to move the National Oceanic and Atmospheric Administration, the agency in charge of salmon in saltwater, to Interior. That's the department that houses the U.S. Fish and Wildlife Service, the agency that manages fish in most inland areas. They are the two agencies most involved in administering the Endangered Species Act in Idaho. The National Marine Fisheries Service, called NOAA Fisheries, manages salmon under the Endangered Species Act -- but the U.S. Fish and Wildlife Service operates federal fish hatcheries. In most of the rivers in Idaho where endangered salmon and steelhead live, endangered bull trout also live -- but those are managed by the U.S. Fish and Wildlife Service under the act. That forces ranchers, loggers, state officials and others who live and work on these rivers to deal with two separate and often conflicting agency directives. That's why the late Republican Congresswoman Helen Chenoweth proposed moving NOAA Fisheries to the Interior Department. State Rep. Judy Boyle, R-Midvale, who was a natural resources aide to Chenoweth in the 1990s, said Chenoweth wanted the change to bring some sense to management along Idaho rivers. "It was such a confusing thing for people," Boyle said. Chenoweth made her proposal after ranchers in Salmon River tributaries like the Lemhi were forced to respond to directives from NOAA aimed at protecting endangered salmon. Those often conflicted with directives from the U.S. 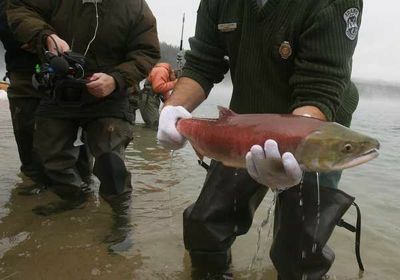 Fish and Wildlife Service, which was trying to protect endangered bull trout in the same waters. NOAA and Fish and Wildlife also had different rules for protecting salmon and bull trout habitat from logging. Managing fish in the Columbia River Basin, an area the size of France that covers most of Oregon, Idaho and Washington and parts of Montana, Nevada and Wyoming, has never been simple. Not only are the competing fisheries agencies involved, but the Bonneville Power Administration, the U.S. Army Corps of Engineers and the Bureau of Reclamation all have some responsibilities in running dams and funding habitat improvements. The U.S. Forest Service and the Bureau of Land Management oversee much of the land that serves as the endangered fish's habitat. The states and Indian tribes also share authority over the fish, which migrate through Canadian waters, into Alaskan nets and all the way to Russia. Snake River salmon were first listed as endangered 20 years ago; bull trout followed in 1998. Fish and dam management issues have been in and out of court since 1993. Obama went back well before Chenoweth's time in office when he explained his proposal for moving the agency that manages weather forecasting and climate as well as ocean science and research. "If you're wondering what the genesis of this was, apparently, it had something to do with President Nixon being unhappy with his interior secretary for criticizing him about the Vietnam War," Obama said. "And so he decided not to put NOAA in what would have been a more sensible place." Nixon did propose moving it later, as a part of a larger reorganization that would have created a single natural resources agency. That has been the holy grail for government reformers, going back to Harold Ickes, Franklin Roosevelt's interior secretary. Ickes sought to bring the U.S. Forest Service back to the Interior Department in the late 1930s. But Gifford Pinchot, the Forest Service chief under Theodore Roosevelt, who moved the Forest Service to the Department of Agriculture, joined his old enemies -- the timber industry -- to kill it. Former Interior Secretary Cecil Andrus kept Nixon's idea alive into Jimmy Carter's presidency, where it died. John Freemuth, a fellow with the Andrus Center for Public Policy and a political science professor at Boise State University, still thinks getting all of the resource agencies under one cabinet secretary makes sense. It especially makes sense in this time of collaborative management, where agencies and stakeholders work together toward policies that meet everyone's interests, he said. Interior contains the U.S. Geological Survey and the Bureau of Indian Affairs along with the Bureau of Land Management, the Bureau of Reclamation, the Minerals Management Service and the U.S. Fish and Wildlife Service. "If we believe that collaboration is the way to do public policy," Freemuth said, "then bringing NOAA in with the U.S. Fish and Wildlife Service and getting everyone in one place make sense." For many environmental groups, putting NOAA in the same agency with the Bureau of Reclamation and the agencies that regulate off-shore oil and gas drilling will water down NOAA's independence and the integrity of its science. Natural Resources Defense Council President Frances Beinecke has taken the lead opposing the plan. "We understand the president's interest in creating a more nimble, coherent entity for economic policy," Beinecke said, "but that can be done without sacrificing the scientific and environmental strengths of NOAA, and the independent perspectives it brings to critical issues." Ironically, it was NOAA Fisheries' science that was challenged by the decision in 2011 by former U.S. District Judge James Redden to strike down the Obama administration's salmon and dam plan. NOAA partnered with two other agencies, the Bonneville Power Administration (under the Department of Energy) and the Army Corps of Engineers (Defense Department) in the failed Columbia-Snake biological opinion. Boise's Pat Ford, executive director of the Save Our Wild Salmon Coalition, doesn't think Congress will do anything with Obama's proposal in 2012. So he's not ready take a strong position on a move he knows divides his coalition. His group has questioned NOAA's scientific integrity in court. Now it is trying to get the administration to establish new talks to resolve the issue following Redden's decision and to recognize the economic potential of a recovered salmon population. "The most important thing is to fix NOAA Fisheries," he said. "It's more important than moving it." Fish and Wildlife Service scientists recommended breaching the four lower Snake River dams in 2000 to improve river flow and fish passage. But those scientists have been all but locked out of the Columbia-Snake debate for the past decade. Critics like Ford say that's because of that recommendation and its scientists' conflicting views. The same agency was clipped by U.S. District Judge B. Lynn Winmill in Boise for political interference by Bush Interior appointee Julie McDonald in the science surrounding decisions about protecting the sage grouse under the Endangered Species Act. Boyle said she knows she might not like the decisions that come from NOAA Fisheries if it's moved under Interior. But such a move would make it easier for Idahoans on the ground, as well as members of Congress. "Right now you have two different Cabinet secretaries to deal with," Boyle said. How Would a New Approach to Managing Endangered Salmon Affect Idaho?